Our latest community energy installation got underway yesterday, 3rd December 2018. Keep watching for updates as it progresses. Harborough Energy has partnered with local joinery firm NBJ to install over 100kW of clean solar energy in Harborough. Harborough Energy recently closed a community share offer raising £100,000 to invest in this second local project. Harborough Energy already manages 67kW of solar in the local area with school and business partners. “We were really pleased to be able to complete our first project 2 years ago, this showed what was possible, but the latest project is almost twice the size and will be a fantastic green addition to the local area” explains Gavin Fletcher, one of the Directors of Harborough Energy. “It is so exciting to have got to this point where installation can begin, especially when the project is partnered with a local employer who recognises the importance of more sustainable business practices alongside local community benefits – profits from this project will go straight into the community over the next 20 years”. NBJ pursue a vigorous Environmental policy and are committed to adopting procedures that ensure our operations do not place the local community or environment at risk of harm. In working with Harborough Energy to deliver this project, we are striving towards continued improvement, by cutting our operating costs and reducing our Carbon Footprint, using renewable green energy. 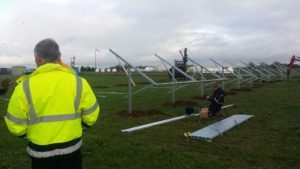 Harborough Energy has retained local solar installer Environmental Energies for this project to try to keep the economic benefits as local as possible.